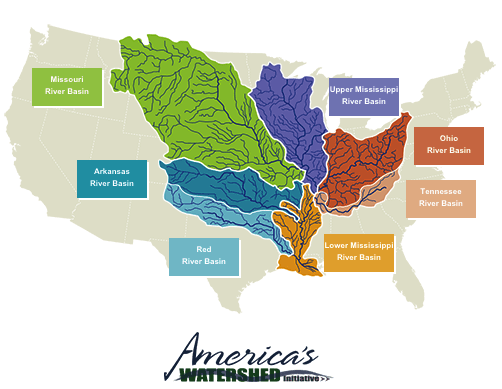 Our heartland rivers make up America’s Watershed—a vital river system that provides drinking water, recreation, habitat, and serves as an economic engine for America. Hundreds of business, government, and science organizations graded the state of America’s Watershed and identified critical areas for improvement. The Report Card for America’s Watershed reveals many opportunities to improve our economy and secure our water supplies if we act together now. Working together, we can find solutions for improving water quality and quantity, safety, and the health of America’s Watershed. The Report Card measured six broad goals for America’s Watershed—Ecosystems, Flood Control & Risk Reduction, Transportation, Water Supply, Economy, and Recreation. The Report Card measures how well we are currently meeting each one of these goals, using real data and relevant information that was identified by experts in these fields. Over time, as we adapt our management strategies for the Mississippi River Watershed, the Report Card can track progress in achieving objectives. Report Card results will help develop a roadmap for collaborative actions to improve the 31-state Mississippi River Watershed and encourage people and organizations to engage in issues that affect it. The Mississippi River is the backbone of America. Our economy and the future of our country depend on sustaining a healthy, functioning watershed. We measured conditions relative to six goals in five basins as well as the watershed as a whole. The results reveal a number of challenges—conditions in three of the basins are below expectations, and in the two remaining basins conditions are just ok. Overall, we give the watershed a grade of D+.